The Painted stork or Painted wood stork (Mycteria leucocephala Pennant, 1769) belongs to the order of the Ciconiiformes and to the family of the Ciconiidae and represents the Asian counterpart of the African Yellow-billed stork (Mycteria ibis). Excepting two small details observable only when close and only by specialists knowing perfectly the two species, it would be quite difficult to be able to distinguish them on the field. Same livery, same behaviour, same size, same habitats, if it were not for the distance intercurring between the two ranges occupied, the problem would considerably complicate. But several thousands of kilometres of distance are sufficient for differentiating these two species and never occurred any overlapping of the relevant territories. It is not difficult to imagine the reason why this stork has been commonly called painted. Used to the traditional white black livery of our species and of the many others scattered in the world, the western explorers of the time at the first contact with these birds could not help but evidencing the most evident characteristics. 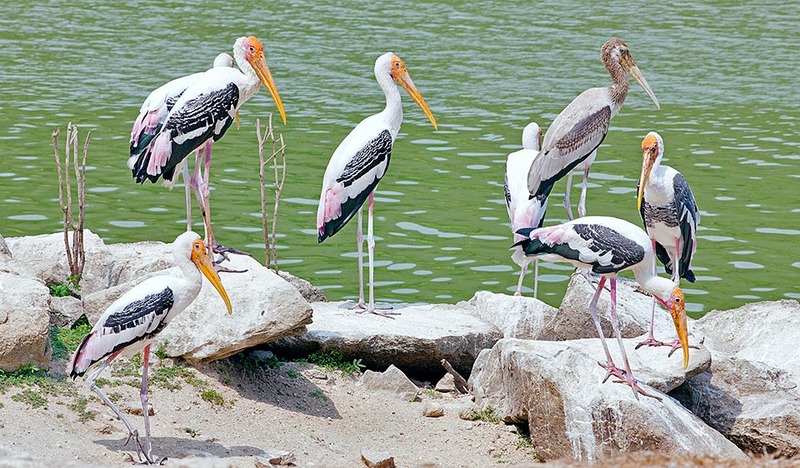 If we consider then that the painted stork is a species that has always been in close contact with the human being, so much to live practically among the population, rural as well as urban, this particular has not by sure gone unnoticed. All vulgar names refer to its belonging to the Indian world and some of them to its colour. 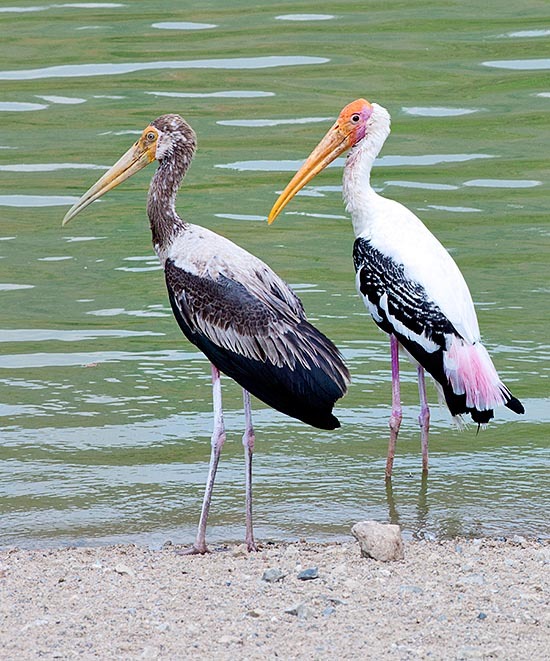 In English, Painted Stork, Indian wood stork, Rosy wood ibis; in German, Buntstorch; in Spanish Tántalo Indio; in French, Tantale indien, in Portuguese, Tântalo-indiano and in Italian, Tantalo variopinto. As it can be noted, in various European common names, Italian included, appears the name of Tántalo. The reference is related to the old character of the Greek mythology condemned to eternal torment by the gods of Olympus as he had stolen them the nectar and the ragweed they were feeding of. This reference has led also to the acceptance of a neologism quite used in the Ango-Saxon world, “to tantalize”, rightly ro remember the long and painful agony of a person. But here what do the torments have to deal? Perhaps, it concerns the torture, or better the obsessive pressure the chick adopts towards the parents for getting the food. The generic name Mycteria comes from the Greek “mukterizo” = nose, to pull the nose upturned, rightly due to the big beak it has and the specific leucocephala from “leukos” = white and “kephalos” = head due to its characteristics even if, actually, the head has a red cover at times quite more marked than that of the congeneric Mycteria ibis. 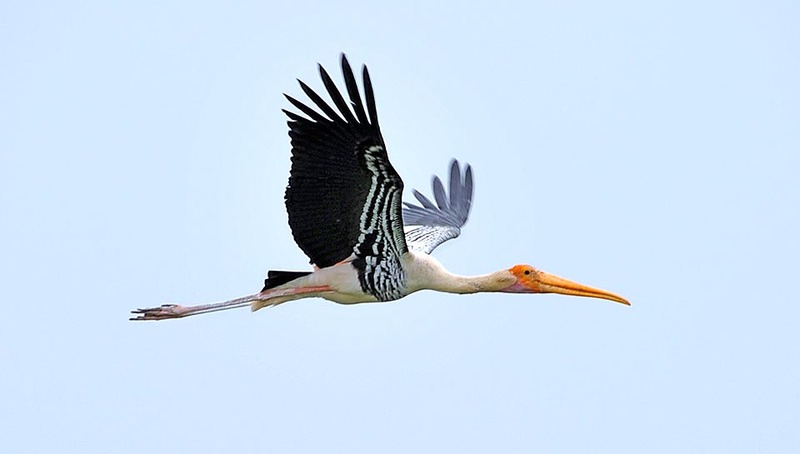 The Painted stork lives in the Indian subcontinent occupying systematically all the territory delimited by the Indus Valley and by the Himalayan mountains, by Bangladesh up to most of Sri Lanka. Strangely enough it is not present in the Kerala region where on the contrary exists an environmental situation quite most suitable than the other occupied territories. It is then present in Cambodia and on the coastal belt of China, from Manchuria to North Vietnam. There is also a small colony in Malaysia close to Kuala Lumpur and in the zoos of Singapore and of Bangkok. Particular is the presence inside the zoological garden of New Delhi, where exists since decades a very numerous colony thus demonstrating the remarkable sociality shown since ever by this stork towards the human being. This stork is a sedentary bird and is subject only to short movements always inside the occupied territory, linked only with the weather situation or the nidification one. In particular the young perform errations that lead them to wander, never at long range, in the same area unrtil when they have reached the maturity, after which they stop and settle permanently in the chosen territory. 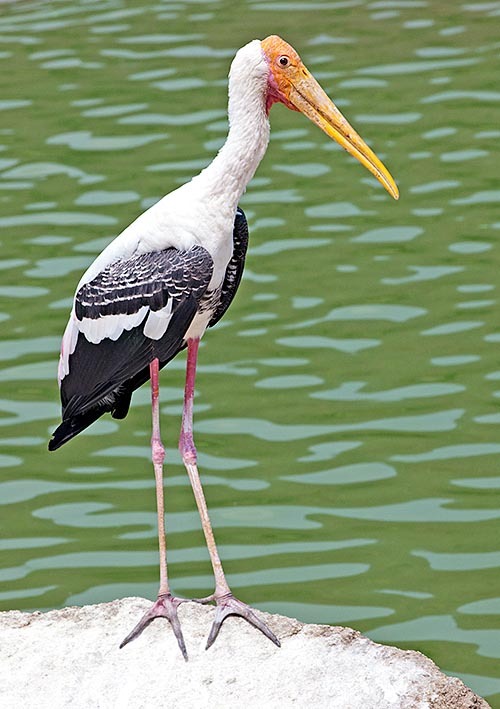 In some areas of the extreme Asian South-East, it lives with the Milky stork (Mycteria cinerea) a rather similar congener with which have occurred some hybridizations. Outside the Asian continent do live to other species quite similar. The Wood stork (Mycteria americana) of the American continent and the Yellow-billed stork (Mycteria ibis) of Africa. The painted stork lives in a very strict contact with the water therefore it is unthinkable to find it in pre-desertic or in totally missing of marshes or of water streams areas. Similarly, dense forests or highly wooded areas or hilly and mountainous lands. It is a typical bird of flood plains, with isolated thickets of big trees where to rest or nidify and possibly without large covers of reeds. It is often seen hunting also along the seacoast. Less specialized than the yellow-billed stork for what the typology of habitat is concerned, this stork adapts to any environment provided rich of water basins, of swamps, of lakes or of water streams where it can find its food. 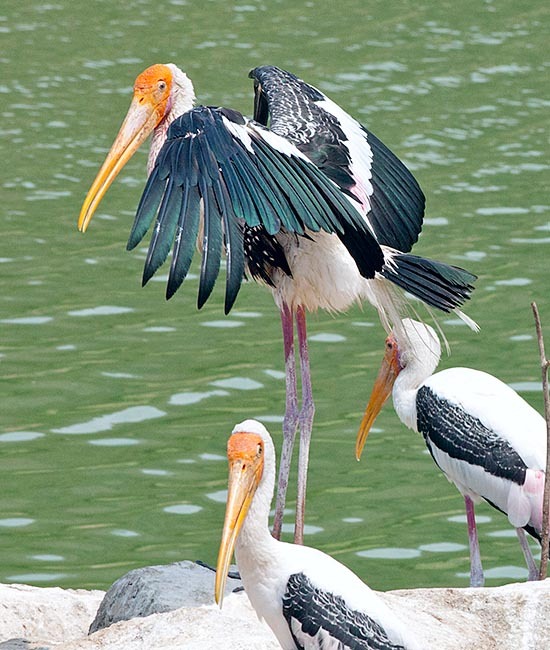 As its common names states, the painted stork is a stork with a very coloured and showy livery. Though having a plumage that from far away may seem the usual white and black, as soon as we get closer or we have the opportunity to observe more carefully its livery, we discover colours of a remarkable gentleness and with very stylish shades. The body and the back are totally white suffused with pale pink that increases remarkably over the tail getting to colour with a very strong pink colour the terminal part of the secondary alar coverts. The primaries and the tail are on the contrary totally greenish black and show up when in flight above as well as in the underwing that consequently results totally blackish. On the upper part of the wing, there is a white belt that contrasts with the black remiges and creates a further contrast well accentuated when in flight. Also the alar primary coverts, even if basically black, are crossed by a thick white dotting, lined up to form numerous parallel lines going along the whole wing. The white chest is crossed by a wide black belt also suffusedly dotted of whitish feathers forming a collar united on the chest, characteristic distinguishing it from the African species that has, conversely, the chest totally immaculate. The legs are reddish pink and act as a pendant to the head that has a featherless facial part that becomes almost carmine pink during the nutial period. Similarly to the congeneric yellow-billed stork that also shows this very coloured part, that of the painted stork goes up to the front to cover half of the head, whilst for the other the same is usually more reduced and gets usually just over the line of the eyes. The beak is massive, conical and rather long and heavy yellow, slightly curved in the final part. The eyes have ochraceous iris and are surrounded by a yellowish ocular ring. The young are totally different from the adults and have a greyish brown livery on the whole body. The dimensions of this stork are remarkable. The body is 100 cm long, the weight is of more than 3 kg and the wingspan is of more than 150 cm. The painted stork when looking for food applies a fairly spectacular technique. While slowly moving in the water, sinks its massive beak almost totally, keeping partially open the two mandibles and moves it zigzagging till when, bumped a small fish or an amphibian, snaps it hopelessly trapping the prey. An incredible quickness accompanied by a sensitivity out of the normal. The painted stork mainly nourishes of small fishes, amphibians, crustaceans, worms but also small terrestrial animals and young birds. This stork has been object of seizing by the rural populations for the family consumption as well as for the trade. It is an extremely social bird that spends the whole life with its similars in groups at times substantial and in particular during the nidification. It is difficult to observe it alone while searching for food as well as during the common flight on the thermals over their territory, important moments of socialzation. The species is monogamous but the couple may vary in each season. The courting for conquering the partner is done by the male directly on the tree where it has been decided to place the nest. Fluttering and cackling, often done with a dry small branch in the beak or with wheezing impulse to stretch the feathers of the wings as if to prove, through the care of its own plumage, the commitment it will have in the future for its progeny. Large trees with a wide crown are chosen where the colony will place nests that will last, renewed, for many years and at times up to the death of the plant. 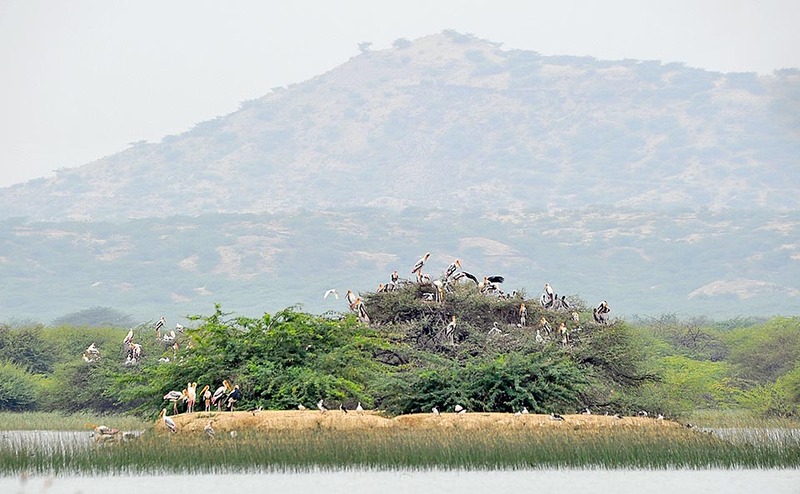 The assiduity in attending the same locations has led this bird to form persistent colonies also in unthinkable places such as in the centre of overcrowded cities. Like its congeners, also this stork lays 2 to 4 whitish eggs hatched by both sexes for about 30 days. The eggs are laid in spaced periods therefore the birth of the chiks is gradual and this causes the presence in the same nest of nestlings having different age, causing at times, in case of food shortage, the decay and death of the weakest ones. The food carried by the parents is regurgitated into the nest close to the chicks, so that they may quickly learn to nourish by themselves but when it’s matter of water for refreshing or quenching the thirst this is directly poured into the throat of the chicks. It is usual for these storks to urinate on their own legs in way to refresh them for fighting the strong heat, result of a nest exposed for the whole day to the tropical sun. As a matter of fact, often are seen ciconiids with very white legs rightly due to this innate habit. The kids fly off after 8 weeks but remain still with their parents for some time more even if they are now abel to get their own food. The maturity is reached by around the third year of age. The species has a life expectancy exceeding the 20 years and is not endangered.